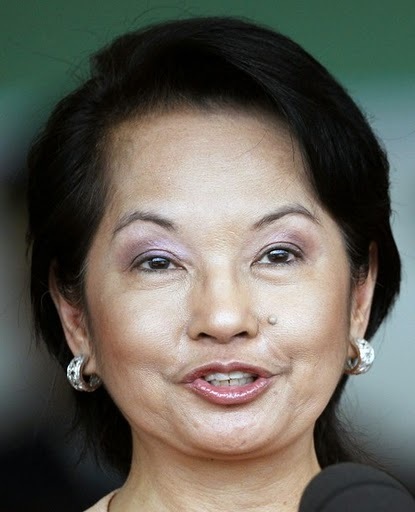 The nation is battered after nine and half years of Gloria Arroyo.Most of us regret placing the little girl in Malacanang after People Power II. She has disrespected all of us. Just look at the "alphabet soup" of scandals associated with her administration:IMPSA Deal Macapagal Blvd. 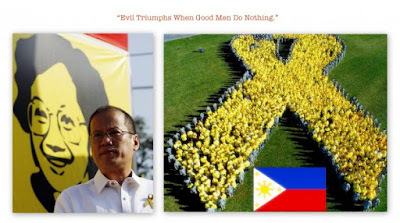 Fertilizer Scam OWWA Funds PhilHealth Cards NorthRail Anomaly SouthRail Anomaly NBN-ZTE Scam CyberEd Scam EO 464/MC 108 Hello Garci Scandal 2004 Presidential Elections Bastardization of InstitutionsBribery of Local Officials Bribery of Church Officials Extra-judicial Killings Enforced Disappearances Immoderate Greed Treason Cronyism Obstruction of Justice Indiscriminate Use of Public Funds Spratlys Deal Venable Contract PSC Horse Importation Road User's Tax TRANSCO Bidding Swine Scam,etc. 1) Making friends with The Rebel (?) Ampatuans. She is widely believed to have benefited in the 2004 presidential election from votes controlled by the Ampatuans, leaving a hefty political debt. Indeed, her main rival Fernando Poe Jr., a hugely popular movie star, reportedly failed to get a single vote in three Maguindanao towns. 2) Orchestrating HR 1109. Members of the opposition had warned of a possible proclamation of martial law and possible “Arroyo dictatorship”, following the approval of House Resolution 1109, which empowers a Senate-Less Congress to convene itself into a Constitutional Assembly to amend the 1987 Constitution. 3) Lifting the phone and calling Garci. This infamous phone call raised very serious doubts about her electoral victory in 2004. 4) Blocking all impeachment attempts against her. The House of Representatives, which is dominated by Arroyo’s coalition allies, blocked all attempts for an impeachment trial. No trial has taken place thus far to clear her of all the serious allegations against her and her accomplices in government. 5) Pardoning Erap so quickly. Estrada, 70, was convicted on charges he took bribes and kickbacks while in office. He was sentenced to life in prison and ordered to forfeit a mansion and more than US$15.5 million (€11 million).As it turned out, Arroyo pardoned Erap almost immediately after his conviction in September 2007. 6) Promising not to to run in the 2004 elections. In front of the Jose Rizal monument in Baguio,Arroyo announced on Rizal Day 2002 that she had to decided to drop out of the presidential race in 2004.”It is God who puts ideas in my heart,”explained Arroyo. 8) Issuing EO 464.In September 2005. Gloria Arroyo clipped the powers of Congress to conduct hearings and to summon officials of the executive department to testify before congressional inquiries. 9) Invoking executive privilege on the scandal-tainted ZTE-NBN deal. Did Gloria Macapagal-Arroyo follow up the national broadband network (NBN) project with then socioeconomic planning secretary Romulo Neri? Was Neri dictated to prioritize the Chinese firm ZTE Corporation? Did Arroyo tell him to go ahead and approve the project despite being told about the alleged bribe? We will never know the answers to these three all-important questions of the Senate. 10) Spending extravagantly in junkets and expensive dinners abroad. Remember her famous call to action for frugality :"I ask our people to spend on the basics before the luxuries so our children will have enough to eat.” Enough said. His platform is not perfect. But it is a serious list of objectives to be accomplished while in office. How does it compare to the platforms of the other presidentiables? Do they have any? "Lahat kami iyan lang ang sasabihin.Lahat ng kandidato sasabihin iyan.We will say the same things...we will have the SAME PLATFORM.For after all, a platform... dadalawang speechwriters lang iyan tatanungin ka.Anong gusto ninyo, 3-point agenda , 10 point agenda 15 point agenda o 25 point agenda." The new president must take bold steps, right away, to tackle the nation's myriad of problems. The Philippines needs a bold plan that ignites our collective imagination, sparks innovation, and creates economic progress. The starting point? A call to action from our new president in the first 100 days of his administration. 1) Launch a Moral Regeneration Campaign. * To provide an opportunity to diagnose the past and present state of the moral crisis in the country. * Reflect on strategies and measures to reconstruct the social values of the new democratic Philippines. * Facilitate the evolution of a dynamic mass movement to help and support the government-civil society initiative in planning an effective program of action for the moral renewal of our society. * Promote national advocacy for the creation of an ethical, caring and corruption-free society. * Strengthen the foundations of our hard-won freedom and democracy by building a strong moral society based on a common code of ethics and behavior. * Abolish the notorious stock distribution option (SDO) as an acquisition option. * Prioritize large landholdings such as the Hacienda Luisita 6,453-estate for land acquisition and distribution.To demonstrate the new president's sincerity, Hacienda Luisita should the centrepiece of true land reform. 3) Establish A "Lead Philippines" Program. Its objective will be to encourage "the Best And Brightest Filipinos" here and abroad to work in the new government. 4) Establish a Council on Economic Competitiveness. It will hammer out details of how to implement a long-term national plan that would offer the most productive labor force and the most conducive environment for business.We must accept the fact that competing on cost/low wages or on abundance of natural resources is not a basis for sustainable competitive advantage of the Philippines. 5) Establish a "Justice For All "Commission. It will be an independent commission to be established with the guidance and technical support of key United Nations agencies and other international bodies, comprising of senior judges, competent jurists, reputed academics and representatives from civil society, including human rights organizations, to undertake a comprehensive review of the country's criminal justice system.